The governor said that a congestion pricing plan is necessary in order to prevent a nearly 30% MTA fare hike, as well as the further deterioration of the transit system in coming years. Gov. Andrew Cuomo pressed for approval of his congestion pricing plan at a speech before the Association for Better New York on Thursday at the New York Hilton Midtown. NEW YORK CITY—Gov. 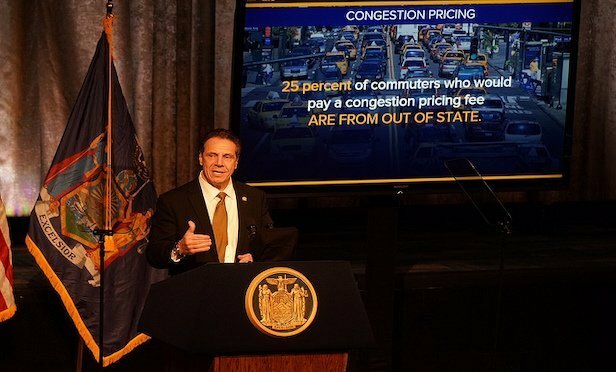 Andrew Cuomo in a speech before the Association for a Better New York on Thursday made the case for congestion pricing in the city, which he says will raise $15-billion in needed funding for the MTA’s next capital plan.